Feeling physical? Enjoy a good punch up? Mark your diaries for our next social mixer on 29th August. Our special guest speaker will be Matt Eaton, Group Publisher and CEO of Tap Media. 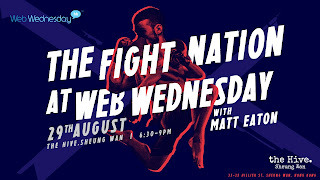 We'll be talking about how to build and monetise a cross-media sports empire under his new mixed martial arts (MMA) brand, The Fight Nation. (find them on Facebook, Twitter, YouTube and Instagram). Topics include tapping into the passion and excitement of live MMA fights, embracing streaming video, launching new pay per view models, addressing mobile viewing habits, cracking ecommerce opportunities and building fully engaged fan bases in an omni-channel world. Doors open at 6:30pm with the hot seat interview kicking off at 7:15pm. An entrance fee of HK$100 gives you one complimentary drink, a captivating talk and high quality networking. Save time and pre-book your tickets online (thanks to Pelago). Venue is the Hive Sheung Wan, 3/F, Hillier Building, 33-35 Hillier Street, Sheung Wan, Hong Kong. Matt is kindly offering our members a HK$200 discount for the inaugural Asia MMA Awards, to be held on 14th September at the Qube at PMQ 元創方. Use the code "webwednesday" when you register via the event website.